To find the premier household and commercial movers in New Jersey, look no further than SeaCure Moving, Inc. SeaCure has been serving New Jersey since 1981 and has moved thousands of its residents, corporations, and offices all over the world in that time. For our dedication to quality, personalized service and customer satisfaction, SeaCure has become a BBB-accredited business and a ProMover-accredited member of the American Moving & Storage Association (AMSA). Whatever your expectations are for your relocation, our professionals will meet and exceed them every step of the way. 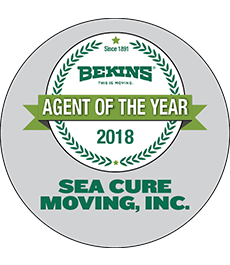 SeaCure Moving is an agent of Bekins Van Lines, which means that we have the comprehensive resources necessary to meet any moving requirement anywhere in the world. Our pre-screened professionals will work with you from start-to-finish, making sure that your move is smooth and stress-free. Whether you have a piano, industrial equipment, or a trade show to move, SeaCure is here to help! Unlike many other moving companies in the area, we provide interior decorator receiving and delivery, declutter and home staging services. Whatever your move involves, our packers, drivers, and Move Coordinators are prepared to meet any challenge.